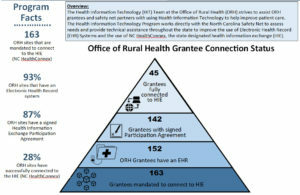 Behavioral and other healthcare providers in rural North Carolina are getting connected to the statewide health information exchange thanks to the state’s Office of Rural Health Information Technology (ORH HIT) program. 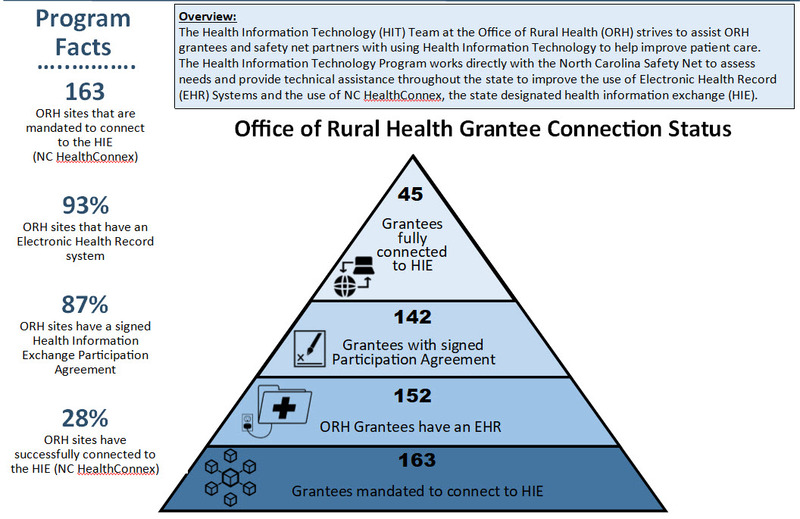 The ORH HIT program evolved from the North Carolina 2015 Health Information Exchange Act (HIE Act), which mandates that healthcare providers that bill for Medicaid or receive state funds for services must connect to NC HealthConnex, the statewide HIE, by June 1, 2019, to continue to receive payments. Last year, the HIT program offered the Behavioral Health EHR Funding Program, and 243 providers applied to get financial as well technical assistance to purchase an EHR and get connected to the state’s HIE, according to Allison Owen, NC ORH Deputy Director. In the future, the HIT program hopes to offer grants to providers that were excluded from Meaningful Use funds such as Long Term Post-Acute Care Providers and Home Health Care Providers, Moore said. “We still find providers whose patient records are still on paper and we have to meet them where they are.” Other providers have implemented an EHR but need additional help in making the switch from fee-for-service to a (CMS) value-based care model, she said. Moore attributes the HIT program’s success to the many partnerships it has forged. For example, her office reaches out to rural physicians through partnerships including the state’s Primary Care Advisory Committee, Medicaid listservs, Medical Society, and Area Health Education Centers (AHECs), as well as via social media channels and marketing tools. The Rural HIT Team meets regularly with members of the HIE Authority, along with the state’s AHEC staff, to share information and update one another on the status of key joint initiatives, Moore said. NC ORH HIT receives 90/10 funding—90% CMS dollars with a 10% state match, distributed through the state’s Medicaid HIT plan, Moore said. The program is in its second two-year funding cycle and will work with the Medicaid HIT team managers to update performance measures in July, the middle of the current cycle, Moore said. Does your SORH have a “Promising Practice”? We’re interested in the innovative, effective and valuable work that SORHs are doing. Contact Ashley Muninger to set up a short email or phone interview in which you can tell your story. The Robert Wood Johnson Foundation (RWJF) has launched a Data for Health initiative to understand how data on health can be used to help people lead healthier lives. Rural health data is sometimes difficult to come by. This is a great opportunity to let RWJF know what data is needed to improve rural health outcomes. RWJF will host a series of “Learning What Works” events in five cities across the country including Philadelphia, Phoenix, Des Moines, San Francisco and Charleston, South Carolina. NOSORH wants to provide the rural voice for this initiative. Ultimately, RWJF wants to understand how communities are using and want to use the data, and what systems need to be in place so that it can be easily accessed and shared. Click here for more information on this initiative. If you are interested in providing input, please contact Kassie Clarke at kassiec@nosorh.org.